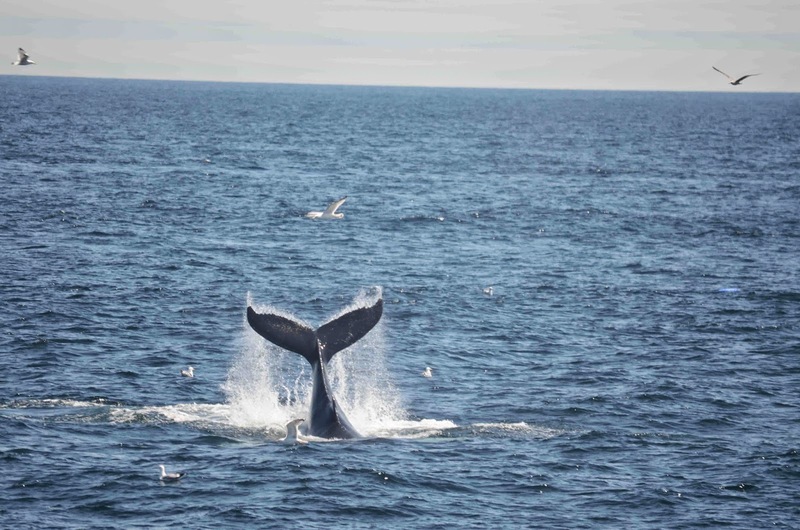 Just when I thought whale watches couldn’t get any better, the many calves out on Stellwagen Bank proved me wrong. 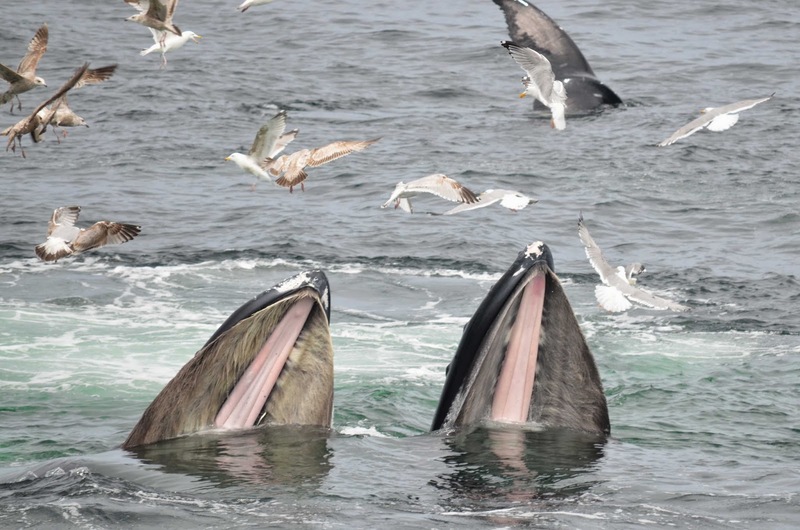 Open mouth feeding—look at all that baleen! In addition to seeing dozens of whales open mouth feeding today, we had five calves that repeatedly breached throughout the entirety of our whale watch. 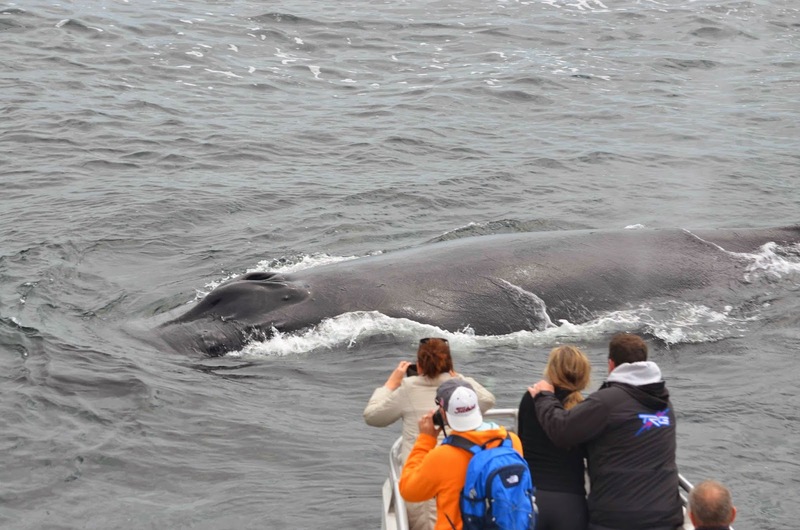 It seems like Tornado’s calf started this trend during the first whale watch today. By the time we arrived on scene, the calves of Vulture, Milkweed, Glo-stick and Tongs had all picked up the behavior. 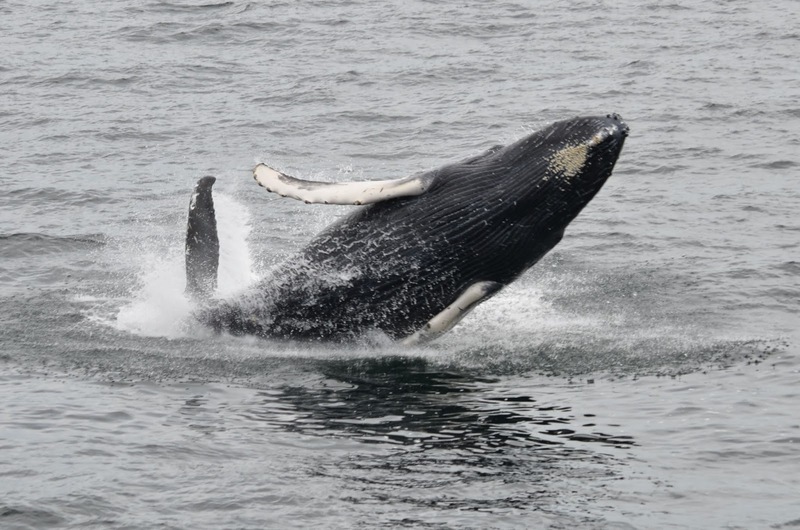 The young humpbacks breached, flipper-slapped and played while their mothers, Daffodil, Geometry and an unknown humpback (see photo below) fed on large groups of schooling fish. 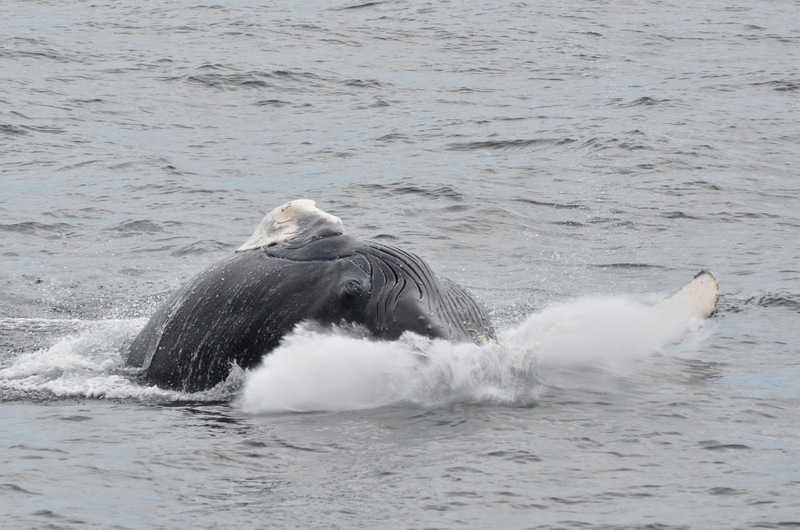 Calves often breach more frequently than adult whales and for longer periods of time as we saw today. Throughout the feeding season here at Stellwagen Bank, calves are very active at the surface of the water as they learn from their mothers what their growing bodies are capable of. Today, we must have seen these calve perform over 100 breaches. This sort of behavior does not happen every day. I saw more breaches today than I have accumulatively on all my whale watches! It was an absolutely incredible experience! 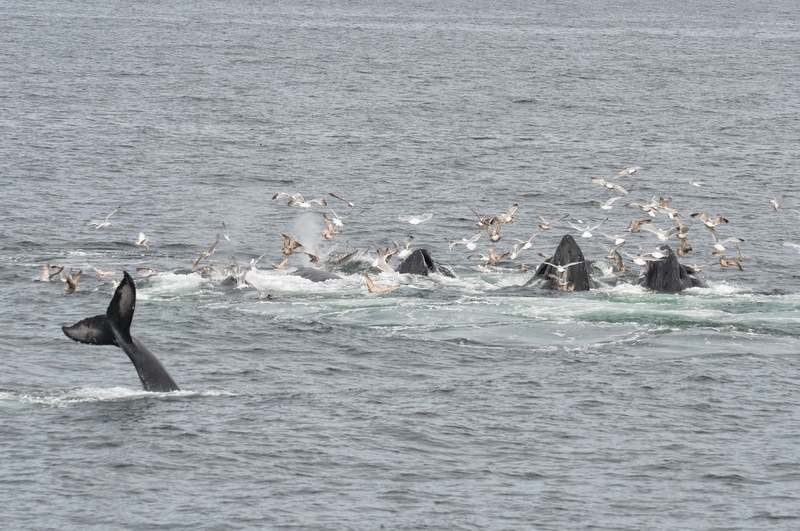 As these calves were breaching, there were 4 to 6 groups of feeding humpbacks in the area. 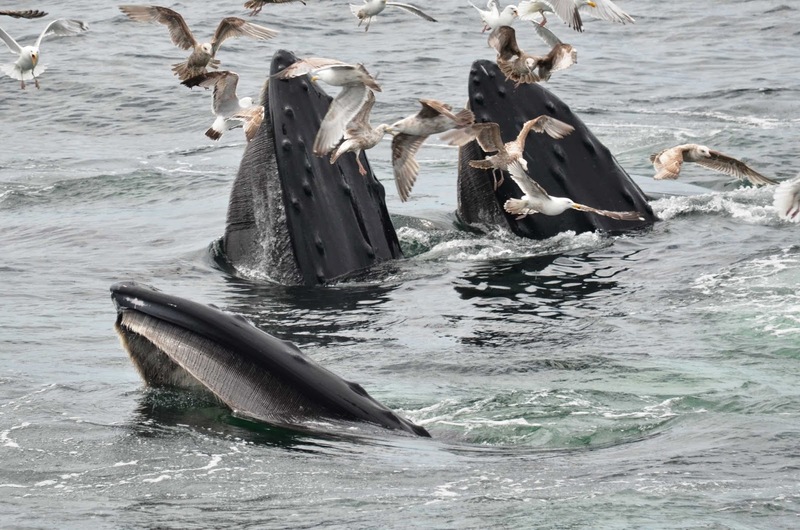 Throughout our whale watch, the mothers and their calves joined up with two other groups of humpbacks which included Jabiru, Yoo hoo and Pepper. We also saw an enormous basking shark on our trip this afternoon! Basking sharks have modified structures in their gills called gill-rakers which function very much like baleen by filtering small marine animals out of the water. We estimated that this particular basking shark was an enormous 20 feet in length! Seeing this amazing whale-like shark was an additional treat on our very special whale watch today! 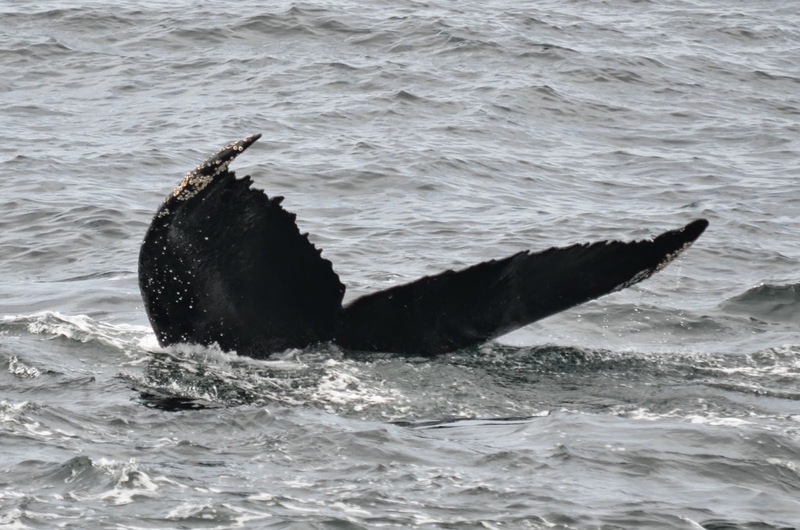 The star of this morning's trip on the Cetacea was Tornado’s calf, who treated us to almost non-stop breaches, flipper slaps, and tail lobs. It was a great addition fantastic bubble feeding and close to boat approaches. We sighted and identified 10 whales today and amazingly we didn’t have any unidentified whales today! We spotted four mother calf pairs: Vulture and calf, Tongs and calf, Milkweed and calf, and Tornado and calf. We also had great looks at Hancock and Geometry who was strangely the only male we saw today. 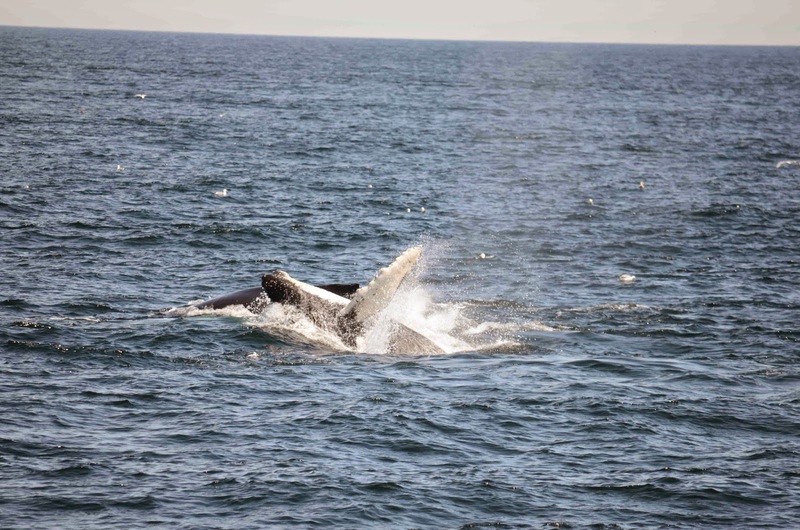 We started the trip with two fin whales but really wanted to find the feeding humpbacks so continued a little farther and started to see blows and big groups of birds. We started with a big group of Vulture, Tongs and their calves with Geometry doing so great bubble feeding with the adults lunging open mouthed through the bait balls while the calves waited at the surface. Hancock also was doing some solo bubble feeding and was defecating quite a lot today. Seeing defecation is actually quite important and there are researchers who can learn a lot about animals from studies the hormones in poop. Today though we could tell Hancock has been eating quite a lot of fish based on the brown color of her poop. 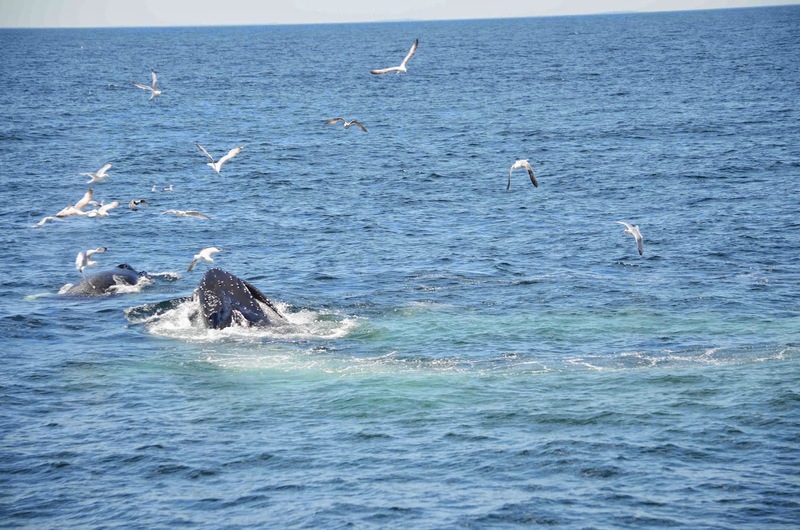 It was a great day on the water with lots of activity and lots of whales.